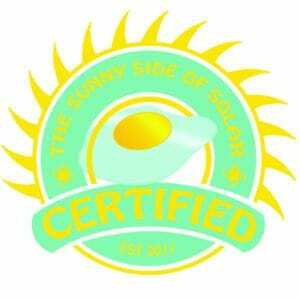 Solar Side up is a full-service, premium solar provider throughout Colorado. We pride ourselves in helping to find affordable, custom, reliable, solar energy solutions for your unique energy needs. We make it simple to go solar. We design, permit, install, commission and help you maintain your system. We provide excellent solar financing too! Jeff Fleischman and Geoff Vezzetti built their business that started with servicing a few of their family members, friends, and neighbors to a company that has helped over 1,000 Residential and Commercial customers. Recognized for their quality installation and ability to deliver they quickly became a top 10 installer in the state. They forged a reputation for professional solar energy installations. Today, we’re taking our success to the next level, and bringing better value to our customers by working with them directly. We are committed to serving our customers with a long-term commitment as our Solar Side Up family. Locally known, Trusted, Experienced, Engaged, Established, and Growing. Solar Side Up is a collection of talent. We all bring our uniqueness to our company that believes in our mission to empower people with the very best in solar energy. Jeff has over 20 years of experience in all aspects of corporate start ups, funding, operations, and technical management of environmentally friendly and Green endeavors in the consulting, construction, emerging technology, land revitalization, retail and electronic technology fields. For Solar Side Up he manages the day to day and growth activities of the company. He also enjoys his saltwater aquarium tank and pinball hobbies along with walks with his artist wife Kendra and two grown daughters. Geoff has over 20 years of Residential, Commercial and Solar experience. He maintains a Masters Electrician License and oversees each installation personally. He has owned and operated his own company for many years. As a Founder of Solar side Up he manages and performs the design, estimating and system installations. He also enjoys his son Austin, fostering Labradors and mountain getaways. Michael has over 17 years in Information Technologies and is a U.S.M.C. veteran. The business development manager and lead to our sales division. His passion for solar is seen with all his activism in nonprofit organizations and his involvement with COSEIA, CRES, and New Energy Colorado. He lives in Lakewood, where he started the Sustainable Neighborhood program for Green Mountain. You’ll see him in a red vest as a National Ski Patroller at Loveland Ski Area during the Ski Season. We're proud of the 1,000 customers we have in our Solar Side Up family. Let us know how we can help you attain the solar you want.